Set within a lovely park and only a short walk to many major attractions, the Hotel Polonia Marianske Lazne is an ideal choice of hotel for a wide variety of travelers. The Singing Fountain, Spa Colonnade, and several historic springs are all just steps from the grounds, and the Goethe and Muse sculpture along with the memorial plaque to Václav Beneš Třebízský would make for a nice walk too. The Hotel Polonia Marianske Lazne is located at Hlavní toída 50/34 and is approximately 20 miles from the Karlovy Vary International Airport. Bedrooms in the Hotel Polonia Marianske Lazne are outfitted with luxury linens and bedding, signature toiletries, a full-sized bathroom with tub, satellite TV, direct dial phone service, high-speed Internet access, and room service. 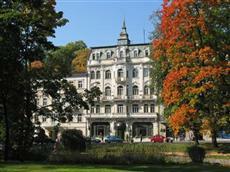 Those staying in the Hotel Polonia Marianske Lazne will be able to take advantage of many services and facilities during their visit, including the spa with massage and beauty treatments, a solarium, bicycle rental desk, an in-house restaurant, a café, 24-hour front desk service, laundry and dry cleaning services, and free parking on the premises.